This modern estate glorifies the true natural beauty of Hawaii. Spacious rooms aluminate diverse stories in imprinting a memorable chapter in your life. Get away from daily burdens as you linger around this vast plantation property, taking in bird songs and refreshing moments by the waterfall. Sugar Mill Plantation is the perfect retreat for love ones to larger groups. 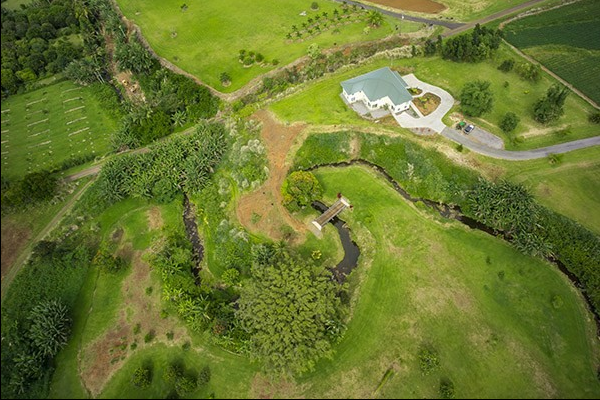 ALOHA!This beautiful home is ideally located along the scenic Hamakua Coast and only a short 12 minute drive from Hilo. What a perfect setting for a wedding, reunion or corporate retreat! You have the option of renting from FOUR to all SEVEN bedrooms! The Old Sugar Mill Plantation is a beautiful home that sits atop the highest point of the 26 acre former sugar mill plantation. It is the perfect setting for a family vacation, reunion, corporate retreat, wedding or other event. Incredible views can be had of the mighty blue pacific, towering Mauna Kea and the lush tropical gardens and waterfalls of the property. There is a large and comfortable common area upstairs to relax and enjoy a good book, watch television or just relax and "talk story". We believe that like many of our guests, you will spend much of your time at the inn relaxing on one of the many lanais reflecting on your day's journey or planning the upcoming adventures.